More than 50 former British diplomats have signed a letter to Tony Blair criticising his Middle East policy. They urged the prime minister to start influencing America's "doomed" policy in the Middle East or stop backing it. They had "watched with deepening concern" as Britain followed the US lead in Iraq and Israel and called for a debate in Parliament, they said. But No 10 responded saying "stability, peace and freedom" remained the objective in the Middle East and Iraq. A Downing Street spokesman added that the prime minister rejected the idea of a "score card" of influence between himself and President Bush. The attack by the 52 diplomats, including former ambassadors to Baghdad and Tel Aviv, is being seen as unprecedented in scope and scale. The document's co-ordinator, former British ambassador to Libya Oliver Miles, said: "A number of us felt that our opinion on these two subjects, Iraq and the Arab-Israel problem, were pretty widely shared and we thought that we ought to make them public." On Iraq he added: "We do think that through lack of planning and through a misunderstanding, a misreading of the situation, we have got ourselves into an extremely difficult situation." The prime minister is urged to sway US policy in the Middle East as "a matter of the highest urgency". "We feel the time has come to make our anxieties public, in the hope that they will be addressed in Parliament and will lead to a fundamental reassessment," said the letter, sent to Reuters. Mr Miles said they did not intend to damage Mr Blair politically but simply wanted to make their voice heard. BBC News Online's World Affairs Correspondent Paul Reynolds said: "The list of names includes many former ambassadors in the Middle East and the publication of the letter shows that their frustration at Iraqi and Middle East policy has broken into the open. The 52 diplomats urged Mr Blair to use his alliance with Mr Bush to exert "real influence as a loyal ally... If that is unacceptable or unwelcome, there is no case for supporting policies which are doomed to failure." 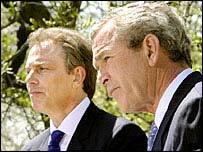 Mr Blair has been a staunch ally to US president George W Bush in pursuing the war in Iraq. The ambassadors accuse the US-led coalition of having "no effective plan" for Iraq after the war and an apparent disregard for the lives of Iraqi civilians. They said Mr Blair had "merely waited" for the US to advance a "road map" for peace that had raised expectations of a lasting Israeli-Palestinian settlement. They condemn Mr Bush's decision to endorse an Israeli plan to retain some settlements in the West Bank as an illegal and one-sided step - and criticise Mr Blair's public support for the move. "Our dismay at this backward step is heightened by the fact that you yourself seem to have endorsed it, abandoning the principles which for nearly four decades have guided international efforts to restore peace in the Holy Land," the diplomats said. They urged Mr Blair to act urgently to challenge the UK's portrayal as a partner in US policies condemned by the Arab and Muslim world. Liberal Democrat foreign affairs spokesman Sir Menzies Campbell told Radio 4's Today Programme the letter came from experts in their field. "The prime minister would be well advised to read carefully what they have said and respond in a grown up fashion," he said. Labour MP Louise Ellman, who sits on the all party parliamentary group on Israel, said: "This appears to be an organised attack on the prime minister and it does not offer a single way forward in Middle East conflict." "There is intense interest in Mr Blair's answer to the letter"